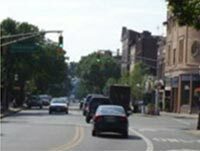 The street and streetscape complements Historic Flemington's downtown. sense of place. The focus is not only on the road itself, but on how it fits into the surrounding community and helps to achieve a future vision. The input of those who use the place on a regular basis is the key to the CSD and CSS process. In 2001, the New Jersey Department of Transportation (NJDOT) adopted a context sensitive design policy to scope, design and build projects that incorporate appropriate safety measures, environmental stewardship, aesthetics and community sensitive planning and design. CSD ensures that the community has input early and often in project planning and development and that flexible design standard is part of the solution to complement the surrounding environment and improve existing communities. NJFIT supports designing roads to fit the surrounding area and to improve a sense of place by representing the unique qualities of the communities they serve. CSD projects lead to "place making" by encouraging private investment to community revitalization and other economic development efforts. NJFIT works with communities developing plans and visions for transportation projects that support the community. The people who work, live and use the space in question are the most familiar with it. Their ideas should lead the planning process and they should be an active part in developing a vision for the area. Early public participation allows a variety of perspectives to be considered and help identify potential problems. CSD creates individualized solutions for each place according to the project's context and design objectives. By doing this the community can achieve harmony and preserve natural resources. The transportation infrastructure should actively preserve and reinforce the valued civic treasures of the community. Draw from many different professionals' expertise, including traffic engineers, design professionals, urban planners and city officials, to work together. Their awareness of how their goals and interests interact keep the project clear and the process more streamlined. If the road is used for regional travel, it should include as few curb-cuts and intersections as possible. Its purpose should be to expedite through traffic. If the road is a commercial street, it should be designed to encourage drivers to pull over and shop. Making streets more "local," with slower traffic, sidewalks and bike lanes encourages pedestrian activity. If the road is in a residential neighborhood, it should encourage slower traffic by reducing lane widths and adding signage. It should also provide safe routes to school where possible. In 1997, the Federal Highway Administration (FHWA) published Flexibility in Highway Design, a guide that provides ideas and examples of ways to balance safety and mobility with environmental, cultural and historical concerns. This guide provides a good start for the context sensitive planning of any project. Additional guidance on the use of flexible design techniques is provided through the Smart Transportation Guidebook developed by NJDOT in partnership with the Pennsylvania Department of Transportation (PennDOT).